From 22/12/2018 until 31/05/2019 every Saturday and Sunday from 10:00 until 16:00. For group visits (clubs, schools, etc) the cave can open during weekdays on request. The tours start every hour. Each tour lasts 30-40 min. Duration of trip from Neapoli – Lachi (Kalenia) – Paradeisi – Kastania – Cave: 30min. 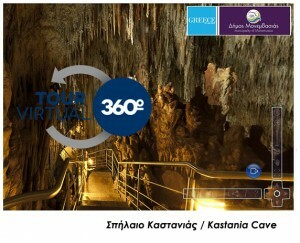 For group visits (clubs, schools etc) and information call at the following telephone numbers: +30 2734360100-115, +30 6986555444 or visit www.kastaniacave.gr. Τhere is a Cafeteria available and good access for large buses.